Last night was our final full governing body meeting of the year - a time to reflect on the past year and think ahead to next year. Members of our school council were invited along to update the governors on initiatives that they had worked on throughout the year. Recruiting Lunchtime Buddies to help ensure more enjoyable play times. Launch of the Smart Fish! The Smart Fish is a story that school council told in assembly. It is a folk tale about a fisherman who always caught lots of fish but one day the fish realised that he was trying to catch them with bait. They decided to become smart fish and swim around the bait. Eventually the fisherman moved away. We explained that this was a bit like situations faced in school where children can be provoked or persuaded to make bad choices by others. We talked in classes about lots of alternatives and how not to "take the bait." These included acting like a brick wall, walking away, telling an adult, explaining clearly what you don't like etc. 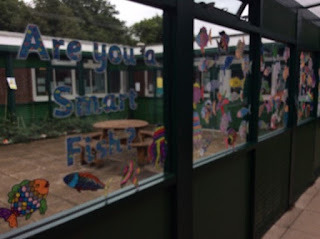 Children around the school who are committed to being a smart fish have coloured in a fish and displayed it in the courtyard - the display looks wonderful. Lunchtime buddies have been a huge success. 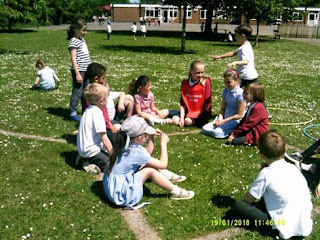 They have organised activities at lunchtime and helped to make sure that everyone has someone to play with - we will definitely continue this next year. Thank you to everyone who has served on our school council this year.